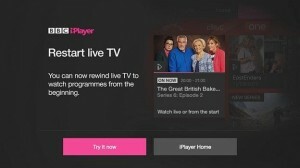 The BBC has unveiled new features and functionality to transform how users watch their favourite BBC TV shows on BBC iPlayer have been unveiled – whether on the go on a mobile, in bed on a tablet or on TV from a comfy sofa. Live Restart on Connected TVs – missed the start of your favourite show on your telly? BBC iPlayer’s Live Restart feature lets you jump back to the beginning of the programme without having to wait for it to end, by simply hitting ‘Watch from start’. Cross-device pause and resume – cross-device resume lets you watch a programme on one device and seamlessly continue watching on another. Sign in and catch up on EastEnders on your mobile in the morning and continue from where you left off on your computer in work on your lunch-break. My Programmes – a new place on BBC iPlayer just for you. Sign in on the website and/or app and find the shows you’ve favourited, programmes you’ve started watching but not finished, and the next episodes of that series – all in one place for you to enjoy. In future, My Programmes is somewhere you’ll also find other programmes we think you might like to watch. The new features build on the BBC’s strategy to make BBC iPlayer more personal – letting the user discover, watch and favourite content that’s more relevant to the user to enjoy on the devices used, when they are used them. These will roll-out just in time for the start of a packed autumn schedule, which sees the likes of Doctor Who, Sherlock and Strictly Come Dancing return to our the BBC’s schedule. BBC iPlayer has also recently updated its mobile apps with a brand new look and feel, making it even easier to enjoy the latest drama from or interrogation from the Dragons in the Den when out and about. In addition, following the news that all pre-recorded programmes are available on iPlayer with subtitles, Audio Description (AD) functionality is now available on iPlayer on TV platforms – as well as computers, mobiles and tablets – making BBC iPlayer the largest and most widely available audio description service from any video on-demand provider in the UK. The enhancements build on a hugely successful year for BBC iPlayer which saw a record 2.6 billion TV requests across 1,700 devices and platforms in 2014, the catch-up window extend from seven to 30 days, and a host of exclusive content – from Adam Curtis: Bitter Lake to Frankie Boyle’s Election Autopsy.